Bernie Sanders "forged new progress," as the Left likes to say, when he ran for president on a socialist message. It looks like he's running again. 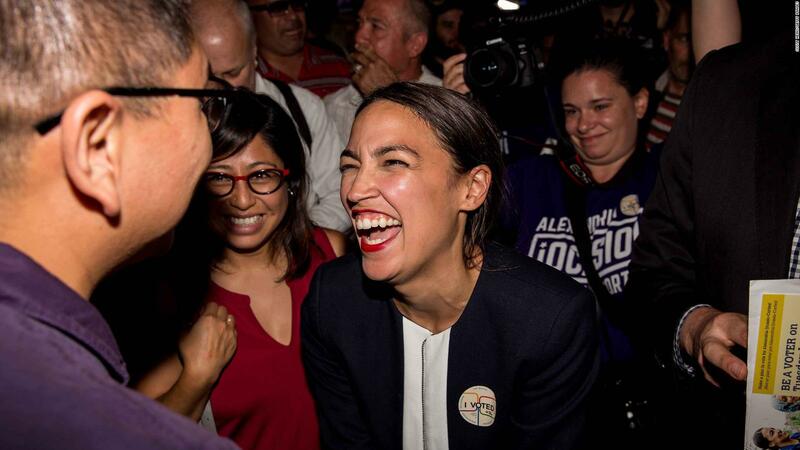 Newcomer politician Alexandria Ocasio-Cortez, who credits Bernie with motivating her to enter politics, is "forging more progress" with her "authentic" socialist Marxist agenda. And it worked in New York's 14th Congressional District. She is not only the darling of the far Left Democrats, including Bernie, she is also striking fear in some Democrats because she is too far Left. Oh, the joy of Progressivism and it's cultural Marxist ideology. A closer look at the progressive movement and Karl Marx, the man behind the so-called "progressive" beliefs. CNN began their report Saturday with this: "It was nearly 2 A.M., a few hours after she felled the 10 term incumbent Rep. Joe Crowley, and Alexandria Ocasio-Cortez was tweeting." She thanked the district that backed her, and Crowley too, for his years of service---service that apparently was no longer far enough to the Left. The win, she said, marked "the start of a movement." "And," she wrote, "there are more of us," naming several young far Left politicians who are---some have already succeeded--seeking to displace older less far Left Marxist Democrats. The irony in her win is that Rep. Crowley was seen as a leading contender to take over leadership of the Democratic House members, replacing Pelosi. Ocasio-Cortez was working as a waitress until she beat Crowley in the primary. When asked if she will support Pelosi if she wins the general election (which she is favored to do in the heavily Democrat District) she wouldn't give a straight answer, which CNN interpreted to mean "no." It is indeed "the start of a movement." What do these hyper-Left kids believe? The Democratic Socialist Party of America. What they believe. The Socialist Party has seen rising dues-paying membership in recent years. There are about 45,000 extremely motivated members spread out across the US---committed to, in the words of Obama, "remake America." The members are backing candidates like Ocasio-Cortez with growing success. CNN editorializes in their news story by quoting members of the Socialists of America writing in Jacobin, the socialist magazine, saying, "For the American Left, which has for so long twisted itself in knots trying to spell out its most basic values, it felt like a watershed moment." They praised Ocasio-Cortez for her "transformational vision." They have found their belief system in a Cultural Marxism worldview. This new wave of young socialists are echoing what Bernie Sanders said during his presidential campaign and they don't own three upscale homes including one on the lakefront as their "socialistic" mentor does. Ocasio-Cortez believes "that in a modern, moral and wealthy society, no person in America should be too poor to live." The Socialist Party has been around for a long time, but in recent years it has been revived by young adults, thoroughly and completely indoctrinated by so-called public "education" and by the likes of Karl Marx and Fredich Engels. Seattle recently gave it's blessing to the Socialist Party by electing Kshama Sawant, a deeply committed socialist activist to the Seattle City Council. Some Democrats are trying to put the brakes on the race toward this new radical progressivism within their party. The Miami Herald carried an interesting article this weekend about a growing fear among Democrats that the young new face of the Party may be "too progressive" for the older progressives like Schumer, Pelosi and others. In a conference held last week, they debated over how far Left is too far Left? They concluded that "time has come to mend, but not end capitalism for a new era." Jim Hines, a Democrat Congressman from Connecticut, said, "There's no question there's a lot of volume and emotion and energy around the more activist wing of our party"---but they can only hope at this point that the race to the far Left runs out of energy. Democrat Party leaders said they are at risk of being "drowned out." They said they hope Democrats will see Cortez's agenda as nothing more than a "grievance list" and will follow the establishment of the party. With Bernie up front in the Democratic Party, already campaigning for far Left candidates, and Hillary still trying to figure out, "What Happened?" and Joe Biden saying he may run for president if he must to save the party and the country---we have a fairly clear look at the coming months politically. But, every Christian and conservative should be informed on the subject of Cultural Marxism. Dr. Norman L Geisler has written an in depth paper on the roots of Marxism and its evolution into Cultural Marxism, which is the heart of what the Socialist Party believes. It defines the vision of the new far Left. Dr. Geisler is a former professor, speaker, lecturer, philosopher, apologist, evangelist and theologian. In fact, some have defined him as a cross between Thomas Aquinas and Billy Graham. I have carefully studied Geisler's work on this subject. I strongly recommend you read his paper on this subject. Cultural Marxism is primarily spiritual, not merely political. Karl Marx was born to a German Jewish family which was converted to Christianity. They joined the Lutheran church when he was six. When Karl was 17, his father wrote this to him: "Faith in God is a real requirement of man sooner or later, and there are moments in life when even an atheist is involuntarily drawn to worship the Almighty." In his youth Karl once wrote, "Union with Christ bestows inner exaltation, consolation in suffering, calm assurance and a heart which is open to love of mankind, to all that is noble, to all that is great, not out of ambition, not through the desire of fame, but only because of Christ." However, as Karl became indoctrinated as a university student, he drew heavily from the philosophy of Georg Hegel's idealism leading him to embrace atheism and extreme activism, which ultimately led to his expulsion from France. He met Friedrich Engels and together they produced the Communist Manifesto. Karl Marx became so rebellious toward God in his militant atheism that he came to believe and advocate that the criticism of religion is the foundation of all critical thinking. He believed man is the highest essence and one must overthrow anything---especially religion, which debases man. Thus the notion among modern day cultural Marxists---like Hillary Clinton, who publicly define biblical Christian beliefs has an impediment to "progress" leading her to say just last year that old Christian beliefs and codes about abortion, etc., must be removed. Obama echoed similar beliefs. Marx also believed that "God did not make man in His image, man made God in man's image." Marx taught that "nowadays, in our evolutionary conception of the universe, there is absolutely no room for either a Creator or a Ruler; and to talk of a Supreme Being shut out from the whole existing world [as deism does] implies a contradiction in terms." He argued that "the only service that can be rendered to God today is to declare atheism a compulsory article of faith and...to prohibit religion generally." He never believed he could completely remove religion. The goal was to render it so ineffective it---especially Christianity--- would become of no consequence in the culture. Marx worked to cause Christianity to become nothing more than a powerless ideology in need of being discarded by a new generation of progressives. Karl Marx's own father believed his son's passion was primarily for fame which transformed Karl's Christian conscience into a demonic passion. "From time to time my heart revels in the thoughts of you and your future. And yet, from time to time, I cannot escape the sad, suspicious, fearful thoughts that strike like lightening: Does your heart match your head and your talents? Does it have room for the earthly but gentler feelings that are such an essential consolation to the sensitive human being in this vale of sorrows? Is the demon, which is clearly not given to or dominated by everybody, of a celestial or a Faustian [demonic] nature?" His father wonders if his son was demon possessed. In the end, Marxism has been responsible for the killing of hundreds of millions of people in the last century. And today in America it is used for the destruction of what is good and pure and righteous. To the Christians who believe they should not be "involved in politics:" Our battle is not about politics or flesh and blood. It's a spiritual battle. And you are already involved. The question is will you be faithful? Be Faithful. Be Informed. Be Vigilant. Be Prayerful.